Did you know that being electrocuted can get you executed? An article that St Mark James CPR will attempt to discuss. Almost the whole world is accustomed to living life with electricity, to cool their hot summer days, to warm their cold winter nights, to light their houses at night, to use their latest technology. Almost everything in the world today needs to makes use of electricity from households to public places even to government offices. Electricity is made available everywhere simply because it is a must. However, it is not commonly known to people the number of incidents involving electricity. In the year 2011, in the Great Britain alone, it was estimated that there is an average of 2.5 million people who received mains voltage electric shock per annum, of whom 350, 000 were reportedly classified as a serious injury (Electrical Safety Council 2011). When one comes into direct contact with electrical current, electrical shock occurs. This electrical injury causes damage to the skin, and sometimes even internal organs. Because the body is composed of 60-80% water, the human body is considered to be a good conductor of electricity. Additionally, the presence of dissolved salts in the form of blood and other body fluids enhances the body to be a better conductor. This allows electric current to pass through the body, which is also called electrocution. This may lead to tissue damage and even death. Nonetheless, the extent of the damage caused by electrocution is dependent upon the current size and amount of time for which it is in contact with the body (Lee Lerner and Lerner 2005). Read more about first aid and CPR faqs. Some electrical shock may be minor causing burns, while on the contrary; serious internal damage may be done on the muscles, heart and brain. Destruction of muscle, nerve and tissues may occur from current passing through the body. Electrical effect on the heart may cause arrhythmia or abnormal heart rhythms leading to cardiac arrest (National Library of Medicine 2011). It is important to not touch a person who has been electrocuted, as the current may be transferred, while the victim is still in contact with the electricity. Basic first aid requires that the power supply be disconnected before coming to aid of a victim. If possible, turn off the circuit breaks or remove the fuse from the fuse box. Use a non-conducting object, such as a folded newspaper, wooden broomstick or pillow to remove the victim from the current source. Do not use metal objects or any wet material as they are able to conduct electricity. If possible, stand on something dry and an insulator such as rubber mat or small stack of newspapers (National Library of Medicine 2011). Immediately check for the ABC’s (airway, breathing and circulation). If either has stopped, commence CPR. Remove clothing that comes off easily if burns are observed and rinse the burned area in cool running water until pain disappears and cover with non-stick dressings. Ice, butter, ointments and other fluffy cotton dressings should not be applied. 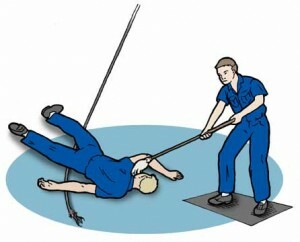 If the victim shows other signs of shock, such as fainting or paleness, lay the victim down with head marginally lower than the body trunk while the legs are elevated. Use a blanket or coat to cover the victim do not leave the victim alone nor attempt to move the victim unless risk of explosion or fire (National Library of Medicine 2011). First aid and CPR courses are offered for people to be prepared in cases of emergencies like these. Proper treatment of victims ensures higher chances of reducing damages and even survival. Lee Lerner K & Lerner BW, ed. World of Forensic Science. Toronto (ON): Gale Cengage; 2005.812 p.